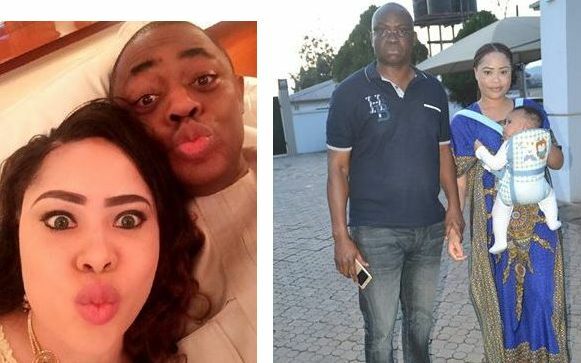 Femi Fani Kayode's wife shares account details to show EFCC are lying. 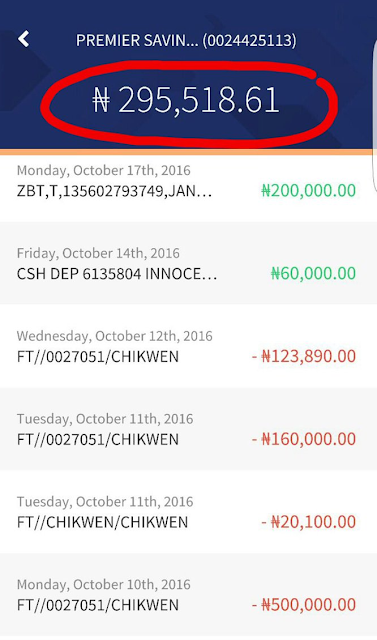 The saga of Femi Fani Kayode's wife Patience,who was arrested and detained by the EFCC in an Ekiti bank continues.Following claims by EFCC that she had a balance of N 2,307,712.82 in the account she went to withdraw money from in Ekiti state,Precious Chikwendu has shared a screenshot of her account balance..
2.4 million naira balance was found in the said account at the time of her arrest is a lie from the pit of hell. The said account was opened in 2005 at Onitsha when Precious Chikwendu was about to start at the University of Calabar. At that time it was not known as Access Bank but Intercontinental Bank. The account was used by her from 2005 till 2012 when it was abandoned and went dormant. It was not utilised or activated again until August 2016 when small deposits of between 200,000 and 500,000 were made into it and the total amount that entered into that account over a period of 2 months was approximately 4 million naira. The money was spent on looking after the family, paying staff salaries and to buy groceries. Consequently at the time that the account was frozen last friday the amount that was left in it was 95,000. She was not notified about the freezing of the account until someone paid 200,000 into it on saturday. The money entered the account but after that it could not be accessed. She decided to stop at the bank on her way out of Ado Ekiti on monday in order to know what was going on and she was then detained and offered to the police and EFCC, together with her 8 month old son Aragorn, for arrest. The total amount that was in the account at the time of the arrest was 295,000 naira which is approximately 600 USD. This is reflected in the screenshot above together with the relevant dates. How Wilson of the EFCC arrived at his figure of 2.4 million being in the account at the time of arrest is mind-boggling and absurd. It is nothing but a shameless and barefaced lie and he and the organisation that he works for are nothing but pernicious liars. It is equally absurd to suggest that the said account had anything to do with Jonathan Campaign funds or Dasuki NSA funds given the fact that the said account was not even active or functional between 2012 right up until August 2016. The Presidential campaign took place in 2015 and at that time the account was dormant. At the time that she abandoned and stopped using the account in 2012 Precious Chikwendu had not even met Chief Fani-Kayode. The lies of the EFCC on this matter are sickening and they are wicked and sadistic people. Chinenye Okechukwu, Special Assistant to Precious Chikwendu. Meanwhile the EFCC countered by saying Precious was not arrested or detained. Contrary to the media spin about the purported arrest of mother and child, a certain Chikwendu Sonia today attempted to withdraw money from an Access Bank account that had been placed on 'Post No Debit' Category, following the discovery of illicit cash flows into the account. She was intercepted by the bank while the Commission was notified but because it was late, the EFCC advised that the suspect be taken to the police station for processing and release on bail. They were arranging to take the suspect to the police station when Governor Ayo Fayose stormed the bank with thugs and his personal security and forcefully secured the release of the suspect, with claims that the EFCC had no power to detain anybody in his state. He also vowed to close down the branch of the bank. The said account, which had a balance of N 2,307,712.82 was flagged following investigation into the PDP Joint Trust fund when the Commission traced N1.1billion to the Zenith Bank account of Fani-Kayode. It was discovered that the account had two biometric identification numbers, one for Fani-Kayode and the other (with BVN 2205597283)for Sonia Chikwendu. The same BVN is linked to 2 other accounts in Diamond bank and 15 accounts in Guaranty Trust Bank.